In diverse habitats, from swamps and rich deciduous forests to dry sandy or rocky forests with oak, aspen, sassafras, and/or pines, often at the edges. 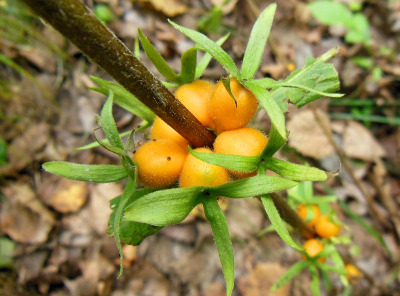 Some authors treat this species as T. perfoliatum var. aurantiacum (E. P. Bicknell) Wiegand. A few specimens have styles clearly exserted (as much as 2 mm), but the leaf bases and stem pubescence are like those of T. aurantiacum. Pubescence characters are not as consistent as some keys suggest, but if many of the stem hairs are long and eglandular or if the pubescence is sparse, a specimen is pretty surely T. aurantiacum. If the hairs are dense, all or almost all short and mostly glandular, it is probably T. perfoliatum. Stems with short rather dense glandular hairs and a goodly number of longer hairs apparently occur in both species, especially on the distal internodes. MICHIGAN FLORA ONLINE. A. A. Reznicek, E. G. Voss, & B. S. Walters. February 2011. University of Michigan. Web. 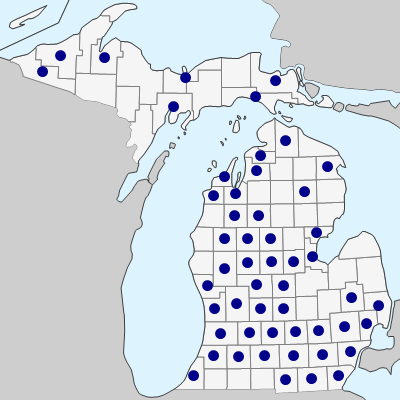 April 19, 2019. https://michiganflora.net/species.aspx?id=734.